iJamming! has provided free content for three years. Please consider making a donation to keep this site independent and active. You can give as little or as much as you like: just click one of the buttons below. iJamming! Wine Contents can be found at the Wine Home Page. For a full list of iJamming! wine reviews, please visit the Wine Home Page. If you've been following the iJamming! wine reviews over the years, you'll have noticed I've never focused on Shiraz. That's not because I don't rate Australia's "national" grape: I brought back a dozen different bottles of Syrah's non-identical twin from my Millennium trip to Sydney. But I am sick of the Shiraz being served in American and British bars, restaurants and wine stores these days. High end Australian Shiraz is another problem altogether. As with American's "national" grape, Zinfandel, there's a tendency among the boutique wineries to make ever more ripe, more raisiny, more alcoholic and port-like wines to satisfy the critics  and given that wine guru Robert Parker has been all over such monstrosities like a pig in muck, the ploy has clearly worked. Somewhere in-between these extremes are hundreds of great Australian Shirazes. You just have to be willing to search them out. 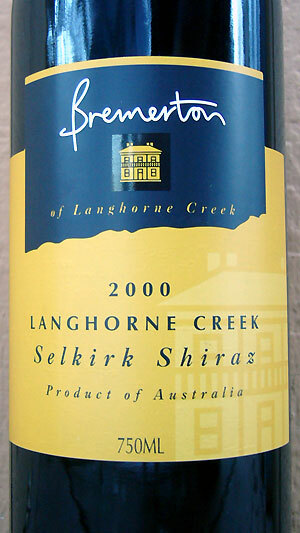 At Astor Wines the other week, I made a point of doing just that  and found myself drawn to the Bremerton 2000 Langhorne Creek Selkirk Shiraz. It was from a relatively unfamiliar yet highly regarded area of South Australia: the cool-climate Langhorne Creek, just south-east of Australia's wine capital, Adelaide. I liked that it was named after the wine-making family's Scottish ancestral home village of Selkirk. (Naturally, in a country as young as Australia, many wine producers cling to their European past: I'm keen to know if the Ladbroke Grove Shiraz is also in tribute to an "ancestral home"!) It was from the 2000 vintage, meaning it had some nice bottle age on it in fact, the grapes would have been picked just weeks after I was in Australia for the Millennium. (Remember, the down under harvest is in Feb-March.) It didn't look too alcoholic: 13.5% suggested a Shiraz that would not get in my face. Oh, and the price was right too: $15, no less than you SHOULD expect to pay for a bottle of quality wine that's traveled half way round the world. In the glass, the Selkirk lived up to all these expectations. Fifteen months in oak had done just what the family web site suggested it should: "enhance its pallet weight without masking the varietal fruit characters." It had the black pepper aroma of good Shiraz and a lovely combination of blackcurrant, plum, mulberry and blueberry fruits, but it was smooth and approachable, gentle on the palate, and neither too sweet nor too bold nor too aggressive. Some of that could have been down to its age, but I suspect this was never a Parkerized 'hedonistic fruit bomb.' Instead, it was a wine with texture and personality and style and grace, evidence that "feminine Shiraz" can and does and should exist. Is it co-incidence that the wine-maker, Rebecca Wilson, is female? You decide. While I would not have mistaken it for any other grape  not even Syrah  it was oceans away from those cheap sweet sugary Shirazes that come by the jug. In fact, it occurred to me while enjoying this bottle to the full: if more bars served more Shiraz like this, people would refuse to drink Yellowtail. But then I sobered up and remembered the old adage Yellowtail knows all too well: no-one ever went broke underestimating the general public. Of course the Bremerton Selkirk is not as readily available as bargain basement shiraz from Rosemount, Yellowtail, Jacobs Creek, Penfold's and all the other Australian powerhouses. But just because you might not be able to find the Selkirk in your home town shouldn't stop you seeking out something similar. Australia is a nation full of committed, proud, hard-working family wine-makers, many of whom would love to strike back against the corporate giants that are swallowing up their industry. Please patronize people like the Wilsons of Bremerton  via Selkirk in Scotland, of course - over the soft-drink manufacturers whenever you get the chance. Believe me, you'll taste the difference. I took just too long to get round to recommending something - and one of our regulars showed up in The Pub to ask why. We've since come together to agree that an Australian female singer would be a nice match for this feminine Aussie Shiraz. Someone with heart and soul, grace and texture. I was thinking Kasey Chambers. Our reader was thinking Frente. You may have your own recommendation. If so, please share it with us. So hot is the typical summer in Provence that the majority of wine producers pick their red grapes early to make tourist-friendly rosé. But in Bandol, a small, noteworthy appellation near Marseilles which has one of the longest growing seasons in Europe, theyve learned over the centuries how best to utilize their unique(ly) challenging micro-climate. Here they make their wine primarily from the challenging but potentially rewarding Mourvèdre grape. Unless fully ripened, Mourvèdre is colorless and flavorless, so the Bandol growers raise it on south-facing hillsides to facilitate the maximum amount of sunshine. Butas soon as it reaches 13% alcohol, Mourvèdre reveals a feral intensity, so it's generally blended with Grenache, grown on north-facing hillsides to keep its own generous alcohol levels in check. Other southern French grapes  Cinsault and Carignan in particular  are often included to make for a heady and hearty wine worthy of a decade's cellaring. Even at a young age, most Bandols are guaranteed crowd-pleasers. 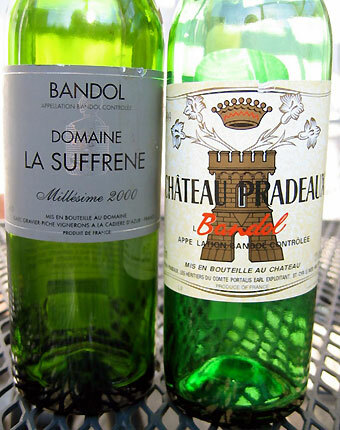 In 2003, I was with a rock band in nearby Nimes, where we went out for dinner, and while the band's instinct had tought them to drink the house wine, I talked them into a Bandol instead. Eyebrows were immediately raised, lips licked, compliments paid, the bottle checked for the tell-tale notes of its black magic, and promises made to pick up more of the same the following morning. You don't need to venture to France to find the stuff. And I didn't need to name-drop: at the Prospect Heights wine bar Half, a (half) bottle of the Domaine La Suffrène 1999 Bandol had exactly the same head-turning effect. In fact, it was so pleasurable I headed up to Astor Wines and picked up a (half) bottle of the 2000 a few days later. The story with Domaine La Suffrène is typical of modern winemaking: for generations, the family's grapes were sold off to a local cooperative until in 1996, proprietor Cederic Gravier decided to make his own wines, a smart move that has resulted in his rapid promotion to the Appellation's front ranks. His Bandol is a relatively forward example of this typically backward wine. A blend of mourvèdre (55%), grenache (20%), cinsault (15 %) and carignan (10 %), coming it at a hefty 14% alcohol, the wine emits Mourvèdre's famous 'farmyard funk' which, in both (ripe) vintages of La Suffrene that I tried, quickly blew over to unearth a rich, leathery, black-fruited, herbal, full-bodied, medium-tannin'ed, slightly acidic and eminently enjoyable wine. Domaine La Suffrène: "a rich, leathery, black-fruited, herbal, full-bodied, medium-tannin'ed, slightly acidic and eminently enjoyable wine." Château Pradeaux: "an inky black brew that offers aromas from the forest floor  earthy, tree bark, wild mushrooms - and the taste of wild animal: all leather, body, bones and blood." At Astor, I also picked up a (half) bottle of the 1999 Bandol by the esteemed Château Pradeaux, a resolutely old-fashioned producer that allows sheep to graze the vineyards in spring, reducing the need for pesticides, does not destem its grapes (almost all of which are Mourvèdre), and allows its wine to mature in large oak foudrés for as long as four years before bottling. All of which means that Château Pradeaux Bandol is NOT a wine of which we discuss fruit. This is an inky black brew that offers aromas from the forest floor  earthy, tree bark, wild mushrooms - and the taste of wild animal: all leather, body, bones and blood. Oddly enough, this complements perfectly the vegetarian foods of the Provencal kitchen, a contradiction perhaps explained by the wine's extra ingredient: its cornucopia of herbal aromas and flavors that are part of the Provencal landscape. And yet this particular Bandol needs additional time to settle down; even importer Neal Rosenthal's web site admits that "Pradeaux in its youthful stages is tannic, backward, and sometimes ornery." For anyone unused to such ferocity, I'd recommend the La Suffrene as an introduction to Bandol's considerably powerful charms. Bandol's strict AC rules, low yields, difficult growing conditions, and lengthy ageing in barrel do not make for a cheap drink. $20 is about as low as you'll find a Bandol; Château Pradeaux and Domaine Tempier typically cost $30 and more. Still, you can taste every penny as you drink. For those days when you want a big, bold bountiful wine - but want to avoid the silicon-tittied fruit bombs of the New World  come down to the tip of Provence and bury your senses in the all-natural breasts of the meaty Bandol beast. Bandol is a dark, feral, broody and bloody anomaly to the Provencal postcard image of sun-kissed beaches and rosé wines. So, for that matter, is the music of M83, whose Anthony Gonzalez hails from nearby Antibes. A Bandol and M83's Before The Dawn Heals Us make for a perfect late-night full-bodied bout. iJamming! Site Copyright Tony Fletcher 2000-2005.